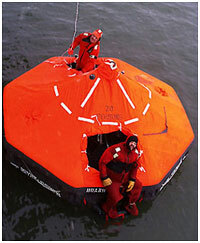 A life raft is a small inflatable boat carried for emergency evacuation in the event of a disaster to aboard a ship. 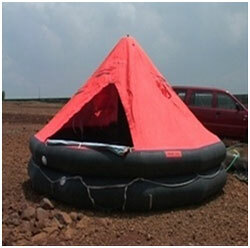 Throw overboard life rafts are designed to be used as independent units or as part of evacuation systems. 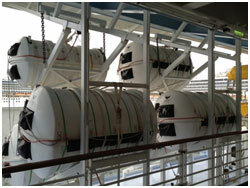 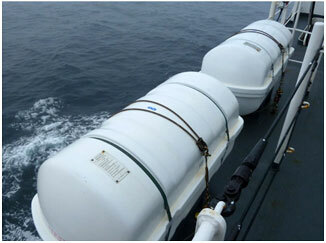 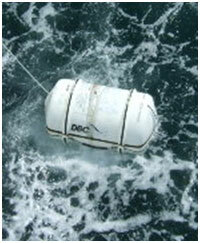 Throw over board life rafts are stored in containers on deck and inflate in the water when the painter line is pulled. 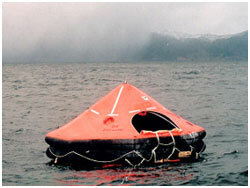 Once thrown overboard the life raft will open and inflate automatically, the Hydrostatic Release Unit will ensure the life raft floats to the surface before inflation .Life raft is used by Navy and all other shipping companies..